I’ve written a lot about words and phrases in my entries up till now, but we still haven’t taken a look at the root of everything: letters. So let’s talk a little about how the alphabet systems differ between English and Japanese, specifically looking at letters, capitals, and acronyms. The first thing many people get warned about when they want to learn Japanese is the fact that the language has three character sets. Outside of Asian countries, most other language systems have just one alphabet. With just one of the Japanese alphabets you have double the number of characters as in the Latin alphabet, so it’s definitely a lot to take in. On top of that, a lot of representations of the Japanese alphabet in Latin characters don’t match up with the pronunciations English speakers are used to. For example, the Japanese character “イ” is represented in the Latin alphabet by the letter “i”, but rather than being pronounced like “eye”, it’s pronounced like the letter “e”. In other words, イ is i but sounds like e. Hard to get used to, huh! One of the downfalls of this is that many people who have just started learning Japanese make a lot of pronunciation mistakes (and the opposite is true as well!). The hiragana and katakana character sets of Japanese, like the Latin alphabet, represent sounds, and you combine them to make words. With the kanji character set, on the other hand, characters represent words or concepts, and don’t always have a single correct pronunciation. Since there’s nothing remotely like this in most Western languages, kanji is one of the more difficult aspects of learning the Japanese language. Hiragana and katakana are basically two different ways to write the same sound. 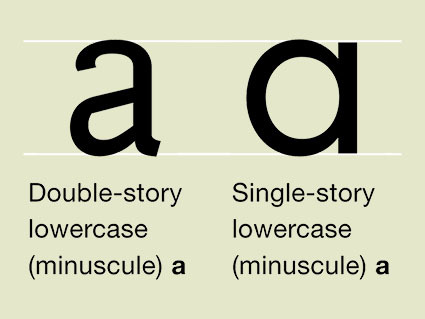 Though we don’t really think of them as “separate” alphabets, the Latin alphabet has two ways to write characters as well: uppercase and lowercase. Even if you don’t speak the language, it’s pretty commonly known that the Latin alphabet has upper and lowercase letters. But let’s take a little look at when it’s proper to use each. -Capitalize the first letter of the sentence. -Capitalize the first letters of all proper nouns. If English is your first language you probably pretty much take all this for granted, but when you really think about it it’s fairly arbitrary. For example, why do we capitalize “I” but not “me” or “you”? That’s just the way things are, I guess. It’s not used often in formal writing, but in dialogue and in online conversation you can write in all caps to better express how you’re feeling. 例：THIS MAKES IT LOOK LIKE I’M YELLING. It’s also common in online conversation to not bother capitalizing anything you write, and leaving off periods goes hand in hand. It’s not exactly proper grammar, but it’s almost a new form of “casual grammar” if you think about it. Japanese doesn’t have “capitalized” versions of its alphabets, but in some cases katakana can be used instead of hiragana to produce a similar effect. Katakana is normally used mainly for borrowed words from other languages, but writing Japanese words entirely in katakana seems to be equivalent to writing on all caps. Aside from upper and lowercase, there are some other character form difference in the Latin alphabet as well. 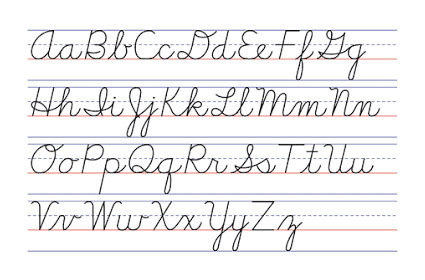 Cursive is yet another way of writing the alphabet. Nowadays it’s pretty much only used for signatures, but they still teach it in school for whatever reason. There’s another situation where you write in all caps that I didn’t mention before: acronyms. In 第5回「ネットスラング」/ #5 “Internet slang” I talked about some internet acronyms, but acronyms are used in a lot of other situations as well. or Pokemon as an abbreviation for “Pocket Monsters”. Initialisms and acronyms are how we shorten words and phrases to just a few characters in English. One of the most common uses of acronyms is for company names. Acronyms are also often used for organizations and government entities, such as the FBI (Federal Bureau of Investigation) and NATO (North Atlantic Treaty Organization). By the way, “FBI” is an initialism, because it’s pronounced by saying each letter, while “NATO” is an acronym, because it’s pronounced as a single word. Even things we think of as simple words can be acronyms: “laser” actually stands for “Light Amplification by Stimulated Emission of Radiation”! The point of using acronyms is essentially to make something easier to say and remember. That said, sometimes an acronym is actually harder to say than what it stands for! “WWW” takes more than twice as long to say than “world wide web”. There are also some cases of semi-acronyms, taking the first two or three letters of each word to form the shortened version. When it comes to alphabets, one of them most important things to remember is alphabetical order. Here’s a track from 巨んc of 北葛西スタヂヲ that’ll help you start learning Japanese alphabetical order, “あいうえお”! Did you learn something this time around? Are you going to pass your JLPT? Learning languages is fun, so if one sparks your interest don’t hold back!